Official data on everything from cancer survival rates to the performance of local schools will be made available to the public under new plans. Cabinet Office minister Francis Maude says the Open Data White Paper will make public services more transparent. He also says it will boost efficiency, improve accountability and aid economic growth. A large volume of data on health, education, transport, crime and justice has already been placed on a website . The Cabinet Office said the new wave of data releases, heralded by the White Paper, would "have the power to change people's lives for the better". It also promised to make official data easier to use - following complaints that statistics released so far were impenetrable to non-experts. It said it would be completely overhauling its data.gov.uk website to give it better search facilities and "simpler ways to access information". In his foreword to the White Paper, Mr Maude said: "The formative years of open government will be tricky, difficult and uncomfortable at times. "But the prize is effective, personalised and 21st century democracy. It's a more prosperous United Kingdom where the public services on which we all rely are strengthened and improved." Every government department has published an Open Data strategy, setting out what information they are going to release over the next two years and how they will "stimulate a market for its use". Mr Maude claimed Britain was "leading the world in making data more freely available" and the regular publication of official data was "holding our feet to the fire all year round, not just at election time". The 9,000 datasets already released include local crime statistics, sentencing rates, hospital infection rates and GP performance. 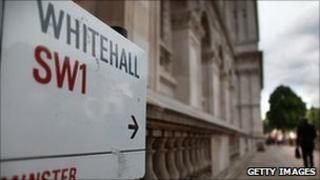 The coalition has also published new items of government spend over £25,000, local government spending over £500 and the names, grades, job titles and annual pay rates for senior civil servants earning more than £150,000 a year. Labour has said it was also committed to greater openness. Mr Maude has vowed to "safeguard the people's data from misuse and rigorously protect the public's right to privacy". But his plans to increase data sharing between different government departments - also included in the White Paper - have come in for criticism from civil liberties campaigners. Mr Maude says he wants to make public services more "personalised" which means sharing "anonymised" data on individuals. The Department for Work and Pensions is running a pilot programme to link and share information on benefit claimants - and a new Social Mobility Transparency Board will "look at linking anonymised data to generate a greater insight in this area". The White Paper says "increasing the availability of anonymised data has the potential to increase the possibility of identity disclosure" and says more needs to be done to "protect individuals' right to privacy and the confidentiality of the data it holds". It says steps will be taken - including the appointment of expert security advisers - to safeguard privacy. The government is also carrying out a review into the way it handles health data, headed by Dame Fiona Caldicott, which will report later this year. it adds. Emma Carr, deputy director of civil liberties and privacy campaign group Big Brother Watch, said: "The public should absolutely have access to more data that is held by public services. "However, this must not be a Trojan horse to allow personal information to be passed between government departments and into the wider world for spurious reasons. "Given the government continues to refuse to enact custodial sentences for those who steal or abuse personal information, it is very dangerous to begin opening up and sharing sensitive datasets without this essential protection in place."